No beans required! 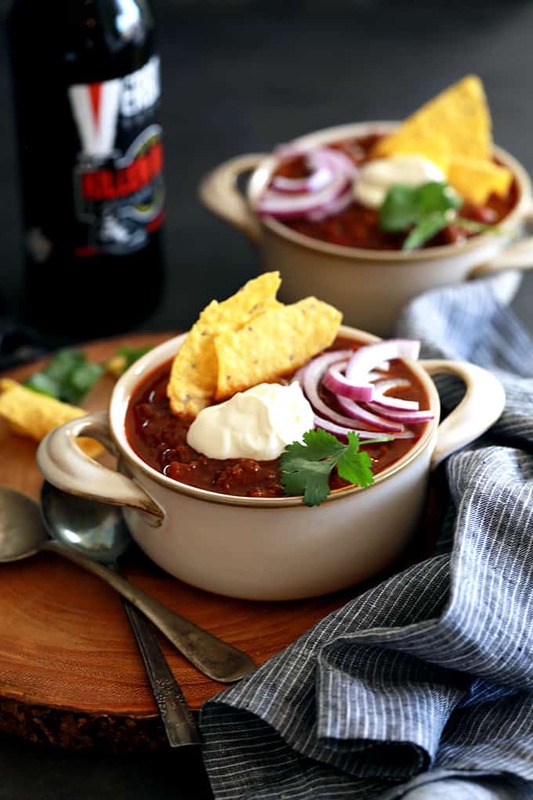 This Beer Braised Beanless Chili is made with ingredients you always keep on hand which makes it perfect for dinner any night of the week. The rich tomato base is highlighted by the addition of your favorite beer that is allowed to cook down and bring a depth of flavor not found in other recipes. We are definitely in full-on soup mode around here these days. Two rounds of polar vortex type cold coupled with inches upon inches of snow will do that to you, I suppose. If there’s one thing that I can count on for my dear husband to request for dinner when the weather outside is less than ideal, it’s a large pot of my Beer Braised Beanless Chili. Which I’m a-okay with because that also gives me an excuse to make a pan of my Simple Sweet Cornbread to go along side it. 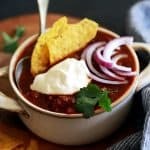 I don’t remember exactly why I originally created a chili without beans as we typically eat them in other dishes, but it totally works for us and I can’t imagine changing it anytime soon. Each member of our family happily gobbles down their bowl of Beer Braised Beanless Chili when it’s served which makes for a happy mama, indeed. Then again, they also practically lick their bowls clean of my Stuffed Baked Potato Chili and Pineapple Pork Chili. What can I say? We love chili! And really, any type of beer will work. I’ve used light beers and dark beers both and it always turns out amazing. Typically I just grab whatever beer seems to have been hanging out the longest in our beverage fridge in the basement and that’s what gets selected. And then of course you have to add your favorite toppings to your bowl to finish it off. 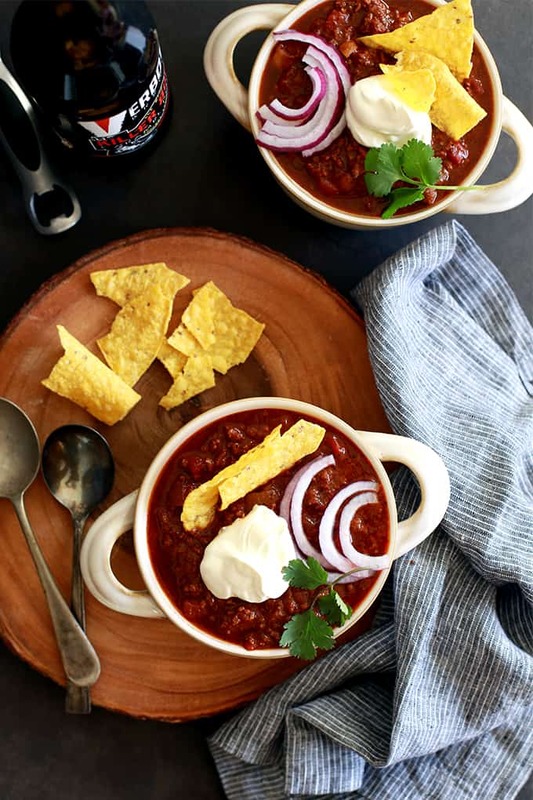 Red onion, sour cream, cilantro, tortilla chips, cheddar cheese – whatever your pleasure, you’re sure to leave the table satisfied after a bowl of this Beer Braised Beanless Chili! No beans required! 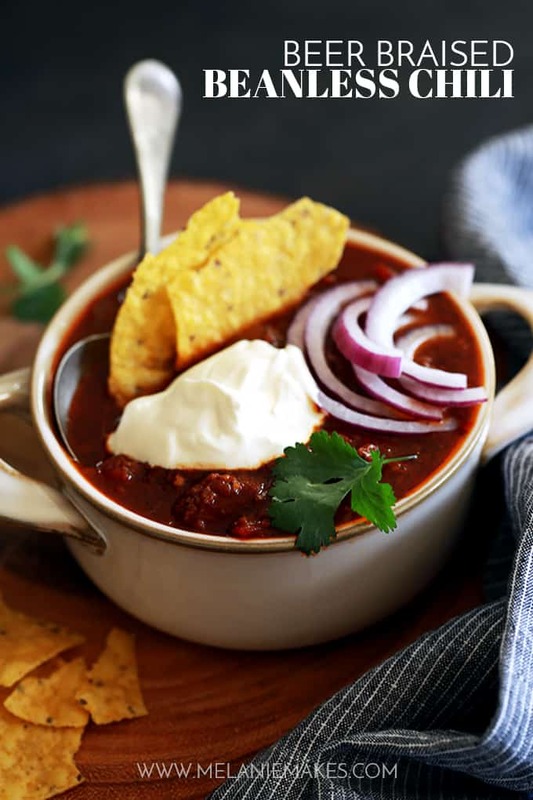 This rich tomato based chili is highlighted by the addition of beer that is allowed to cook down and bring a depth of flavor not found in other recipes. This Beer Braised Beanless Chili is made with ingredients you always keep on hand which makes it perfect for dinner on a weeknight or any night. Add onions and garlic and saute 3-5 minutes, stirring frequently until onions are soft. Add ground beef and brown, another 3-5 minutes. Season meat and onions lightly with steak seasoning or salt and pepper. Add beer and let reduce by half. Stir in broth, tomato paste, diced tomatoes, chili powder, cumin, barbecue sauce and hot sauce. 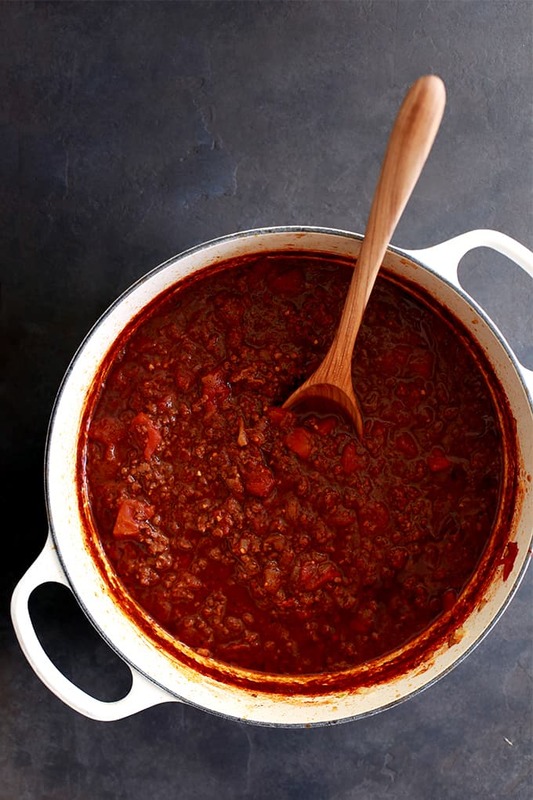 reduce heat to medium-low and simmer 10 minutes or until desired consistency. Not only is this Beer Braised Beanless Chili amazing on it’s own, it would also make for a show stopping ingredient for this Chili Stuffed Acorn Squash, super fun Chili Cheese Stromboli and these amazingly delicious Oven Chili Cheese Dogs. I feel like I can SEE the flavor in this chili, it looks so good! And I bet the beer is such a rich and delicious addition! Can't wait to try this recipe! Let me know what you think, Rebecca! Hi! I love your website! I hope you don't mind that I've shared your post with our readers (linking here for the recipe of course). I can't wait to make this one myself. Thanks!! You're so kind, Sarah - thank you! Appreciate your support and sharing the link to this recipe with your readers! Loved this! !I am so happy to have found this amazing recipes! I pureed black beans and added it to the chili along with Chocolate, the baking kind unsweetened. My husband hates beans, but I wanted the added fiber for the family. :) Thank you for the recipe. So glad you enjoyed this, Angel! Thanks so much for taking a moment to let me know. So appreciate it. Looks amazing! We are beanless chili eaters too! The idea of beer sounds delish. Melanie. . your chili looks delish! I've made chili with mexican beer. . I can use any beer right? Hey, Alice!Yes, any beer you'd like works perfectly! I've used several different brands, always with great results. Melanie, As a vegetarian I looked very closely at this and decided that I will try it with kidney beans replacing the ground meat. 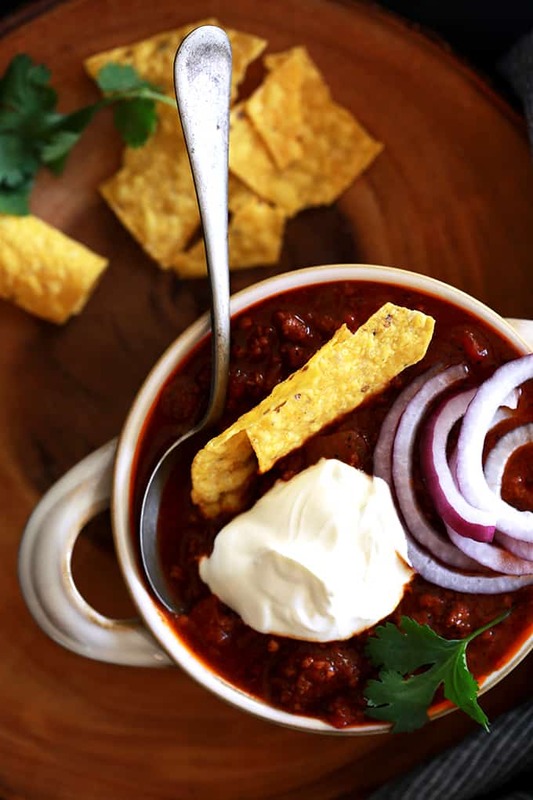 I loved the flavors you have added to the original chili and so it is worth the attempt.